UNITED NATIONS, December 21 -- When Nobel Peace Prize winner Tawakkul Karman came to the UN earlier this year, she denounced the Gulf Cooperation Council's "immunity deal" for President Ali Saleh, and her supporters chanted, "Saudi Arabia out of Yemen!" Now in the run up to an ostensibly post-Saleh Yemeni government to be elected on February 21, Inner City Press on December 21 asked UN envoy Jamal Benomar about the impact on Yemen and his mediation work of Saudi Arabia, the United States, and Qatar. Video here, from Minute 28:25. 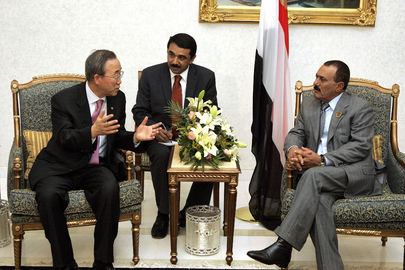 Saudi Arabia in 2009 took military action against the Houthis in Yemen, just as it has more recently in Bahrain. The US is described as engaged in a stealth or drone war in Yemen, and Qatar is known to fund some parties in Yemen, just as it has in Libya. Benomar, ever the diplomat (actually for his views he has been imprisoned and committed, too far among current UN high officials) told Inner City Press that "Yemen has neighbors, there are important members of the international community." He said that the situation in Yemen "effects maritime routes in the areas, and also Yemen is next door to some of the biggest oil fields in the world... The concern of the international community is there... We work very closely with Saudi Arabia, with the GCC countries." Video here, from Minute 29:35. In a process that, for example, Russian Permanent Representative Vitaly Churkin has praised, Benomar described "in Sana'a a group of Ambassadors of the GCC and P[ermanent] Five [members of the Security Council] collectively... speak with one voice." Some have said wistfully they wished this type of major power collaboration was possible on, for example, Syria. That seems unlikely, not only with reference to Benomar's work, but because in Yemen all the major powers oppose Al Qaeda, and all but perhaps Iran are willing to sacrifice the Houthis to Saudi Arabia. And so it goes.